Larissa values proactivity and clear, upfront communication in her practice. Whether she is advising on the development of personnel handbooks, helping a company avoid discrimination charges, or guiding clients through state or federal litigation, clients comment on how clearly Larissa explains the legal issues at stake and the pros and cons of various options. Larissa is so passionate about law and legal argument that she enjoys listening to Supreme Court oral arguments in her spare time. 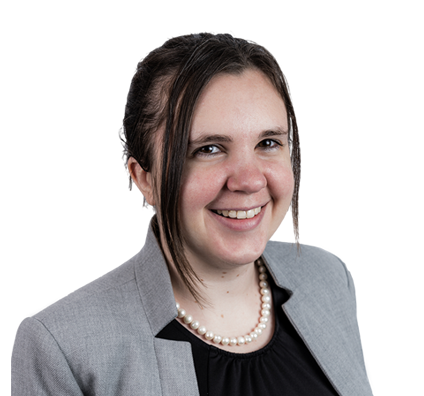 Her excitement about her field means that she stays on top of ever-changing labor and employment regulations, and she is always aware of what a new federal or state policy could mean for clients. Larissa is a frequent contributor to the firm’s labor relations and education blogs. Guided private university on security protocol and qualification requirements for security personnel. Advised client on obtaining religious exemption to certain federal employment regulations. Guided clients through responses to discrimination charges. Obtained dismissal of federal Racketeer Influenced and Corrupt Organizations Act (RICO) claim for small-business client. Coordinated collection and review of thousands of pages of electronically stored information in cost-efficient method for national client. Is the Enforceability of Your Employment Arbitration Agreements Waiting on the Supreme Court’s Decision in Epic Systems Corp. v. Lewis? Larissa enjoys playing with her son, hiking, trying new foods and listening to U.S. Supreme Court oral arguments. As a former reserve sheriff’s deputy, Larissa has a special interest in law enforcement and continues to monitor law enforcement guidance on weapons. She is well versed in Civil Rights Litigation Section 1983 and has defended Section 1983 employment discrimination claims for public-sector employers. Larissa also advises national clients on guns in the workplace policies and has counseled a private university on security protocol and qualification requirements for security personnel.